Successfully Added BetterLife Equator Tank Clearomizer - 2.5ML, Top Filling, 0.15-Ohm And 0.5-Ohm Coil, Adjustable Airflow, 510 Tread (White) to your Shopping Cart. The BetterLife Equator tank clearomizer lets you upgrade your current vape mod kit by providing a powerful and tasteful vape experience – allowing you to take the most out of your upcoming vape sessions without needing to replace your trusted vape mod. As a clearomizer, the BetterLife Equator is capable of holding plenty of your favorite tasting e-liquid in its tank – letting you enjoy multiple relaxing and tasteful vaping sessions without needing to constantly refill your electronic cigarette. Simply attach this remarkable tank clearomizer to your current box mod, fill up your tank, and you’ll be all set to sit back and enjoy a great vape experience. 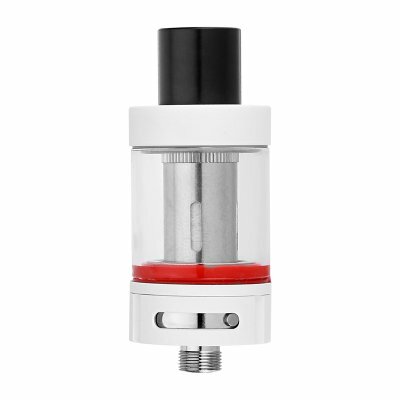 Featuring a durable design that has been put together with high-quality stainless steel components and finished off with a clear glass tank – this stylish white and red colored tank clearomizer is sure to turn some heads. Thanks to its rebuildable design, the BetterLife Equator tank clearomizer is easy to clean and lets you replace individual components whenever necessary. Added to that this beautiful clearomizer features a 510 thread, making it compatible with the majority of box mods in the market. No matter the current box mod you’re using, the Equator tank clearomizer is guaranteed to upgrade your vaping experience. Coming with two coils that feature a 0.2-ohm and 0.5-ohm resistance, the BetterLife Equator is capable of handling high amounts of Wattage – letting you enjoy a powerful vape while allowing you to create exceptionally large vapor clouds. To increase your vape experience even further, this tank clearomizer supports manual air flow control through which it allows you to regulate the airflow into your clearomizer. From now on you’ll be able to fully customize your vaping experience and personally control the amount of taste and vapor your e-cigarette will produce. Being the perfect upgrade for all vape mod kits out there, this beautiful clearomizer is guaranteed to enhance your vaping experience – allowing you to take the absolute most out of each and every upcoming vaping session. The BetterLife Equator tank clearomizer comes with a 12 months warranty, brought to you by the leader in electronic devices as well as wholesale electronic gadgets..